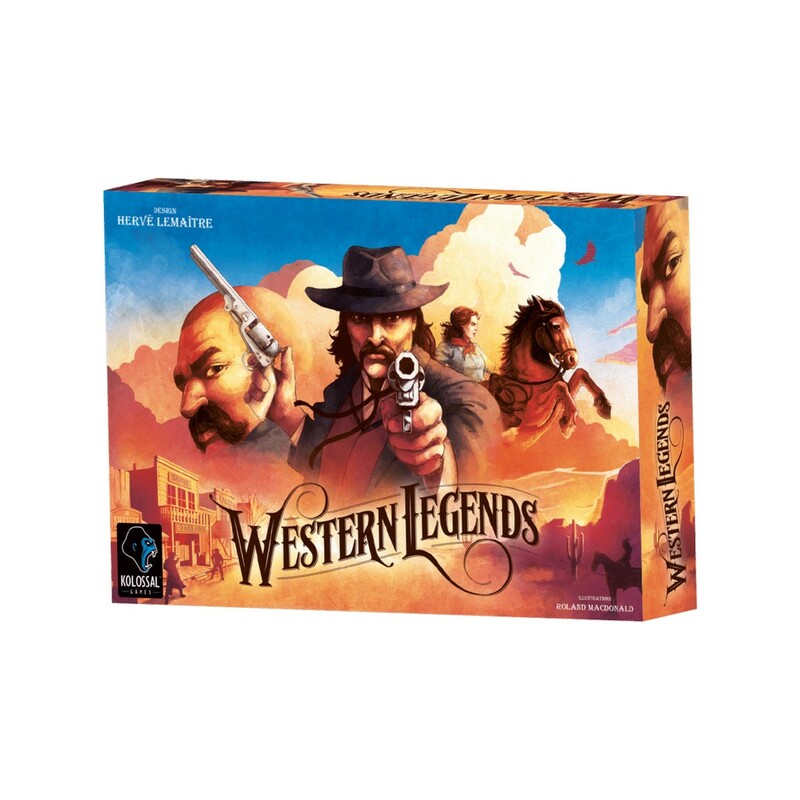 In Western Legends, players can rob the bank as Billy the Kid, evade the sheriff as “Doc” Holliday, or rustle cattle as Calamity Jane. From the creative mind of Hervé Lemaître, players will enjoy a highly narrative and interactive experience, choosing a life of crime as a Wanted character or justice as a Marshal. Western Legends features historical characters from the American old west brought to life with the beautiful illustration work by Roland MacDonald. In Western Legends, players can rob the bank as Billy the Kid, evade the sheriff as “Doc” Holliday, or rustle cattle as Calamity Jane. In the end, the objective is to go down in history as the most legendary figure of the time. Over the course of the game, players will need to react to random events, complete jobs and objectives, and equip themselves to survive. Purchase a mount, weapons, and other items necessary to get through the troubled times in one piece. Mine for gold, wrangle cattle or hold up other players. You can do it all in the open sandbox environment laid in front of you! Your actions determine where you fall in the eyes of the law. Players will enjoy having multiple paths to victory and a diverse set of characters and options to choose from, ensuring that no two games will ever be the same. Additionally, the game features incredible miniatures, custom sculpted by Pure Arts Studios. While there is plenty of content in Western Legends, players will find rules and gameplay to be simple and straightforward. Whether you choose the path of a wandering gunfighter, a small-town sheriff, or a successful lawman planning to retire, only one player will emerge as Legendary!